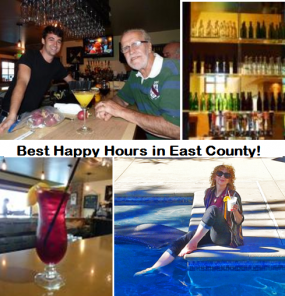 September 4, 2014 (San Diego’s East County)—Our intrepid team of East County Eaters have been on the road in search of the best Happy Hours across our inland region. (It’s a tough job, but someone’s got to do it!) 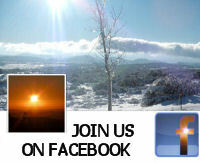 Each week, we’ll be featuring two locales offering diverse experiences. Whether your tastes run to sushi bars or cowboy bars, wine bistros or craft brew pubs, urban eateries or mountain taverns, you’ll find plenty to whet your appetite! 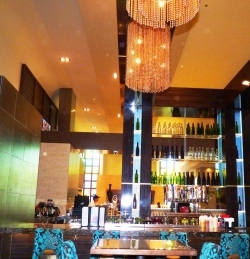 To kick off our series, we start by featuring two of our favorites: Terra American Bistro, a bistro and bar that prides itself on farm-to-table fresh cuisine--right down to the fresh-squeeze passionfruits in our cocktails and the refreshingly tasty and affordable appetizers, plus we tried our luck at Viejas Casino and Resort -- a four-star vacation destination hotel with some great specials sure to make you happy. Cheers! One word: Nirvana! That’s how I’d describe the Tangerine strawberry cosmo, which includes tangerine juice, strawberry-lavender vodka, lemon sour and fresh mint. This cocktail was a happy hour special on the day we stopped in at Terra American Bistro, known for its herb-infused, hand-made liqueurs. I thought it couldn’t get any better—until a regular customer, Harold Weber, bellied up to the bar with a bagful of home-grown passion fruits. The bartender obligingly blended up a heavenly rum-based “Passion Daiquiri” and shared samples. “I love doing it,” said Sam, the bartender. He’s not the only top talent here. Chef Jeff Rossman is the author of From Terra’s Table, a cookbook. He previously owned a popular San Diego restaurant and specializes in farm-to-table fresh cuisine feature mostly locally-sourced ingredients. The happy hour specials on drinks and food vary daily and range from ultra-affordable ($2 grilled fish tacos on Tuesdays; this week’s included yellowtail tuna and salmon, minimum of 2 tacos) to the indulgent $9 cocktail we savored. You can get decent California house wines (we sampled a Dark Rose cabernet) and several satisfying local craft beers (Ballast Point, Karl Strauss and Manzanita when we stopped in) for just $5. All appetizers are $2 off regular pricing during happy hour. We sampled roasted brussel sprouts with asiago cheese and pot stickers, each under $10. Other specials this particular week included mussels and wine on Sasturday night ($10 total) , smoked chicken liver pate, and a salmon nigiri sushi with peach-chipotle risotta, wasabi and sesame. The location is just one block west of La Mesa on El Cajon Boulevard; look for the tractor out front, symbolic of Chef Rossman’s commitment to support local farmers, too. The Happy Hour will be changing in mid-September, so watch for new specials coming soon. Ah, paradise! Lounging beside (or in) the pool while sipping a mimosa or piña colada is just one of several enticing experiences at the Viejas Casino & Resort, ranked four diamonds by the American Automobile Association (AAA) as a hotel vacation destination. You’ll find great happy deals at the V-Club lounge inside, where you’ll find specials seven days a week. Mondays through Fridays, Viejas offers two happy hours. Early birds can imbibe $3 mimosas, $4 screwdrivers and $5 bloody Marys from 10 a.m. to 1 p.m. Later in the day, from 4 to 7 p.m., Viejas has a second happy hour featuring $4 well drinks, $3 domestic draft beers and $3 house wines. There’s even a bar area on the middle of the casino floor, for those who want to try their luck at slot machines embedded on the bar. Or soak up some sunshine poolside, beat the heat on reclining lounge chairs in the pool’s shallow end, or on cool winter evenings, cozy up beside fire pits with your special someone. Specials include Mixology Monday for $7 specialty cocktails, such as a Cucumber cilantro Martini in the V-Lounge, wine Wednesdays with premium wine discounts, low cost sangrias all day Saturdays and bloody Marys on Sundays. There are even some non-alcoholic drinks that are none-the-less indulgent, such as virgin pina coladas and pineapple punch, perfect for sipping poolside, where you can also get snacks such as $5 fruit and $7 turkey croissants, as well as drinks of the month, such as this month's strawberry mojito. Need a designated driver? You can take the V-Club bus free to the Viejas Casino & Resort, located on the Viejas reservation in Alpine. The bus picks up at locations across our region, including El Cajon in East County. For a free return ride, join the V-Club (it’s free) and also gives you special discounts including the delicious Viejas buffet (normally $25.99). The array is lavish – with temptations ranging from king crab legs to elegant dessert pastries prepared by Viejas’ gourmet chefs—but that price includes unlimited beer, wine and champagne. The buffet also features a bloody Mary bar on Saturdays and Sundays.